Make your crew uniforms stand out with a few, carefully chosen details. 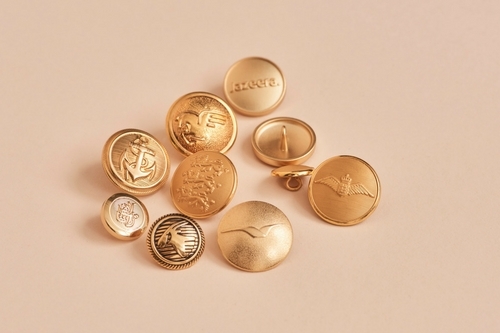 Customizing your uniform buttons will add a unique feel to your staff look. Trends change, but true style never dies. Customized uniform buttons fit into the last category; unheralded features that stand out and add a new dimension to the overall look. Do not underestimate the power of integrating unique features as they can bring your brand to life. You don´t always have to go big to make a difference. Buttons on a uniform jacket might seem like an insignificant feature. They offer a cost-friendly solution to customizing your corporate look, while adding branded attributes recognizable to potential customers across touchpoints. One issue regularly facing our clients is whether to incorporate their company logo or name when customizing buttons. You should go with the option that matches your overall look and feel, and shows off your brand values. Some companies prefer to highlight the corporate identity by making the logo the center of attention. Others opt for the company name. Obviously, if your company name is very long, you might run out of room. Or end up with miniature letters that no one can decode, thus wasting time and money. A solution could be to use abbreviated company names. SAS (Scandinavian Airlines) have taken this route and staff travelling the world are easily recognizable to customers. Whether you want gold, silver or another color, options are limitless. Below are some of the gold colored buttons we have created to add an extra touch to uniforms worn by staff at Qatar Airways, Jazeera Airways and others. The design varies from company to company to meet individual needs and show off their individual identity and heritage. The same applies for our silver colored buttons. Silver buttons offer a more subtle alternative to the shiny gold buttons, but the effect is similar if incorporated properly with the overall uniform design. Study the customized logo button from Flytoget above and notice how the orange merges seamlessly with the silver to create a subtle yet recognizable button. Most companies want a solution unique to them. Flytoget have succeeded. Be inspired by how others have conquered the challenge; but create your own look – and stand out. Reach out to discuss your options and to see how you can incorporate customized uniform buttons.